Home What are insulation R-values? A n R-value is, in short, a number that tells you how good a material is at resisting the flow of heat. If it resists the flow of heat well (has a high r-value) then it's a good insulating material. 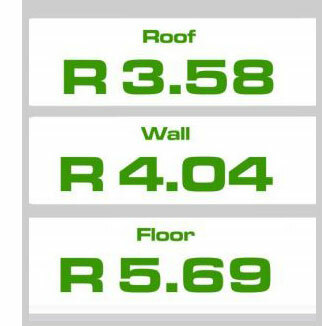 For the purposes of insulating a building then the higher the R-value, the better. You could think of R-value as the 'resistance value'. 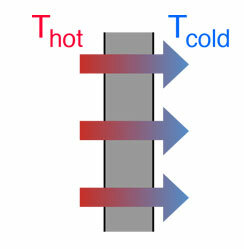 The number indicates essentially how fast heat was transferred from one side of the material to the other, like the image to the right demonstrates. There are, of course, influencing factors that will change or affect the R-value of the material so it's best to note that R-values don't apply to loose-fill or blown-in insulation like it does to mineral wool, glass wool, insulation board and other standard insulation products. Manufacturers will give an R-value for each insulating product they produce and they'll often give an R-value depending on where that material can be installed too. What affects the R-value of insulation? R-value is determined by the material that the product is, the thickness of the product, and the density too. Other factors that specifiers and architects will consider are the impact on the insulation of temperature, aging and exposure to moisture. All of these smaller factors are variables that can change the R-value of a product and reduce the overall insulating abiltiies of a structure. For example, insulation that's been compressed into a kitchen wall may not achieve the R-value advertised as it's exposed to moisture and has been compressed. It's worth double-checking that the product you're looking to install is compatible with high levels of moisture to ensure consistent performance. Does the R-value change depending on where insulation is installed? R-value is affected by the area of application but the difference in R-value really depends on the material itself. Most manufacturers advertise an R-value per approved application. For example, SuperFOIL SF40 has an R-value given for installation in a roof, walls, and floors as shown to the right. The location of the insulation changes the R-value as other materials like beams and joists in a roof transfer heat more rapidly. This means in simple terms that the insulation has more heat to resist the flow of. You'll need to install more layers of that insulation to make it thicker to contend with the lower R-values of that application so you can reach the performance levels you're after. Increasing the thickness of the material, or of the overall structural build-up, will increase the R-value with dense products as the entire build-up will become more resistant to the flow of heat. How do you work out the R-value of a structure? The R-value of a structure can be worked out by adding up the R-value of each individual component that offers a solid, consistent layer in the structure. Like this rudimentary 'wall' example below, the constituent parts come together to make the total R-value. For more information on insulation values, including R-values or any other measurements, contact our team on 01752 692 201. You could also use our live chat in the bottom right hand corner between 9am and 5pm to speak to an expert directly.